Edgar Wright’s Baby Driver comes out of the gate so strong that it’s a wonder it keeps its rhythm. The writer/director has carved out a comfortable niche in this arena of filmmaking that exists somewhere between refreshing ingenuity and reverent pastiche. His latest certainly has the whiff of Quentin Tarantino, circa the mid-1990s, but it never feels as if Wright is straining to imitate the other filmmaker. As in 1994’s Pulp Fiction, the dialogue crackles with pop-culture references and cheerful profanity, but that dialogue is its own language, with the actors adopting an unexpected rhythm that is also theirs alone. Take Kevin Spacey, an actor with a specific type of charisma, who plays Doc, a crime boss with our protagonist in his debt and with the specific agenda of never using the same crew more than once, though, as we see, he does rotate within a specific circle of colleagues and accomplices. The character is almost impossible to pin down as a villain, speaking carefully modulated cliché after carefully modulated cliché, and in fact, the treatment of the man as a kind of father figure for our protagonist complicates any attempt to figure him out even further. Spacey’s performance is exceptional at finding what we cannot: whatever makes Doc tick. The heist that opens the film has been conceived and planned by Doc, although the specifics of it aren’t that important. It’s a way of introducing us to the main players. The semi-exception is Griff (Jon Bernthal), who exits the team when this job ends, but Buddy (Jon Hamm) and Darling (Eiza Gonzalez), a psychotic Bonnie-and-Clyde pairing, factor importantly into what follows the opening bank robbery. Their driver is our protagonist, a dreamer named Baby (Ansel Elgort) whose prowess behind the wheel can be attributed to the focus that his music gives him. Baby’s soundtrack guides the film itself in its editorial sensibilities (particularly during a clever shootout in a warehouse that is quite literally edited to the beats of the song on one of Baby’s iPods). The soundtrack has an emotional logic here: Baby was involved in a car crash that killed his parents, a car crash during which he was listening to music, because of his mother’s (played by Sky Ferreira) former occupation as a singer. The accident left him with a “hum in the drum,” as Doc puts it – a constantly ringing feedback within his ear canal that is successfully drowned out by music. As such, music is a constant on that exceptional soundtrack, which spans genres (from classic rock to easy listening to, in that shootout, a Latin reggae favorite), musical artists, and eras. The plot kicks in once Baby tries to find a bit of happiness in his dead-end existence of driving for Doc, who knows the kid’s weakness lay in what he loves. At first, that would be his deaf foster parent/roommate Joseph (CJ Jones), whom Baby underestimates in the number of goings-on he can work out through careful observation of the nightly news and Baby’s stacks of cash hidden under a loose floorboard. Baby’s list of loves grows when he becomes enamored with Debbie (Lily James), a restive waitress at the diner where Baby’s mother used to work. The two fall quickly for each other, and eventually Baby ropes her into his plan to cut ties with Doc. This doesn’t sit well with the crime boss, as you can probably imagine. The romance between Baby and Debbie is the good-hearted center of a film whose edges are filled in with very bad people, and it helps that the performances by these two are as effective as they are. Elgort plays Baby as a bit of an oddball, likable but closed-off from normal human interaction (“I’ve talked to you tonight more than I’ve talked to anyone all year,” he tells Debbie, who is visibly both flattered and baffled by this). James is the paragon of goodness and moral clarity, injecting the latter into a climax that pits the two against opposites. The rest of the ensemble – from Spacey to Hamm and Gonzalez (who share genuine chemistry as a joker and his harlequin) to Jamie Foxx (whose performance as the mysterious and psychotic Bats, another player in Doc’s twisted heists, is an expert mixture of menace and glee) – is superb, certain to be one of the best of its kind this year. The cast and Wright’s unflappable sense of style in the car chase sequences (which flatly refuse to be quick-cut disasters and incorporate reasonable geography and superb sound design alongside Jonathan Amos and Paul Machliss’s quixotic editing) combine to afford the film itself a refreshing flavor, and Wright’s expert weaving of his narrative suggests total control of some genuinely bonkers twists and turns. There is a unique visual language (as per usual for Wright) at work in Bill Pope’s exquisite photography, particularly in some cleverly unbroken takes. 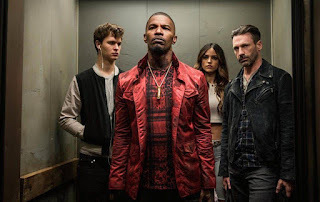 Really, there’s something new at every turn in Baby Driver, a thrilling new vision from one of our best working filmmakers.